This product is milk to which acidophilus culture (beneficial bacteria) has been added. However, the milk is not actually cultured as yogurt. In the process of making yogurt, milk and an added starter (beneficial bacteria) are placed in a warm environment (such as a temperature-controlled yogurt maker) so the flora can ferment the milk, thickening the milk. Acidophilus milk has the same culture, but has not gone through the full thickening process. Originally a by-product of butter making, buttermilk is now a milk product cultured with lactic acid. It is available in both skim and low-fat varieties. Some buttermilk has reduced lactose content, which can make it an option for people who have difficulty digesting the lactose in regular milk. To make this concentrated product, half of the milk’s moisture is removed by evaporation before it is canned. Evaporated milk is sometimes used in cooking, both because it is easy to store and because it curdles less easily when heated than other milk. Unopened, it can be kept at room temperature for up to six months. Once opened, it should be transferred to a clean container and used within three to five days. This type of canned milk, also made by removing half of the water from whole milk, is highly sweetened, and also very high in calories. Goats’ milk is very similar to cows’ milk; it is higher in calcium by a very small margin but also notably higher in fat. Some people with allergies find they have fewer problems with goats’ milk. In the homogenization process, milk fat is broken into particles so small that it is emulsified and held within the milk, instead of floating at the surface. 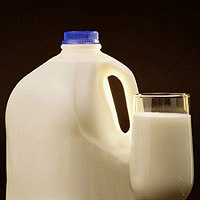 In the United States today, almost all milk is sold homogenized. Jersey and guernsey cows produce exceptionally rich milk that has a higher percentage of cream and butterfat. With its reduced lactose (milk sugar) levels, created by adding the enzyme lactase, this milk is available for people who, because they lack the enzyme lactase, have difficulty digesting milk. Pasteurization is the heat process used to destroy potentially harmful bacteria in milk. Two basic processes are currently in use: in the first, milk is heated to at least 161°F (71.6°C) for 15 seconds; in the second, the milk is heated to 280°F (137.7°C) for two seconds. This product is popular with cooks and budget-minded milk drinkers. To create it, some of the water is evaporated from the milk, and then the milk is sprayed into a drying chamber to further reduce its moisture content, resulting in milk powder or flakes. The powder, available in several forms, including instant nonfat dry milk and dehydrated buttermilk, is easily reconstituted for use by adding water. Raw milk is unpasteurized milk, meaning it has not undergone the heat process used to destroy potentially harmful bacteria. The risk of bacteria (such as listeria and salmonella) in raw milk has prompted states to impose restrictions on its sale. However, raw milk has many proponents who claim that health benefits are lost in the pasteurization process. If choosing raw milk, make sure that it is produced hygienically and stored properly. Several types of milk products have been developed over the years that have a long shelf life, such as canned milk, powdered milk, and ultrapasteurized milk. All these products can be stored without refrigeration in unopened packages or tightly sealed containers for up to six months. Ultra-high-temperature (or UHT) milk is processed at temperatures that produce a product with extended shelf life. Packed in presterilized, aseptically sealed, brick-style cartons (like juice boxes), UHT milk can be stored without refrigeration for about six months. Like canned milk, this milk requires refrigeration once the container is has been opened.